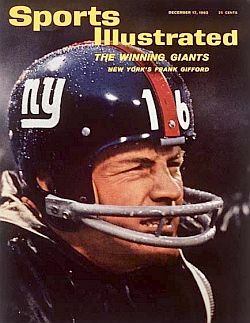 The headline regarding Frank Gifford’s death shocked me. The family reported that he died suddenly from natural causes. I was privileged to meet and chat with him in January 2013, while working on The Game before Money. He just lit up talking about the old days. His youthful energy resurfaced remembering his playing days with Tom Landry, Andy Robustelli, and Harland Svare. His eyes gleamed with delight. His eyes really stood out. The televisions of the 1970s lacked the definition to convey the color. They were a light shade of blue I’ve never seen before or since. And this is coming from a guy who doesn’t pay attention to the color of a man’s eyes. Only Gifford’s stood out that much that they were memorable. Iconic. Football changed dramatically from the time Gifford started playing in high school to the time he left Monday Night Football. Gifford told me that he expected to follow his father’s rugged footsteps into the oil fields of the San Joaquin Valley, without any extra thought about his future. A high school guidance counselor told Frank that he might be able to get him a scholarship at USC if he played football and improved at school. Gifford played well enough to earn a scholarship, but had to go to junior college to improve his grades, even after getting straight A’s his senior year. He made JuCo All-American and was offered all sorts of scholarships. He stayed with USC. Gifford, a first-round NFL pick, signed for $8,000 and a $250 signing bonus. Back in his day, players had to work off-season jobs to supplement their NFL income. Gifford pursued acting in the off-season, doing both stunt work and obtaining speaking roles. He told me that off-season work ultimately led to his career in broadcasting. The path of off-season work leading to a post-NFL career was common, even into the 1980s. Irv Cross told me many players saw the NFL as a stepping stone to their next career move. By the time Gifford left Monday Night Football in the late 90s, lucrative contracts won through free-agency rocketed player salaries. Gone were the days of needing to work in the off-season. Television was a huge part of the NFL’s growth, and Gifford’s role on Monday Night Football was a huge part of it. Here was a trained actor – a natural fit for a television host – between the enormous personalities of Don Meredith and Howard Cosell. Back then there were only three networks – CBS, NBC, and ABC. Now, ESPN owns more than three networks alone. Credit Pete Rozelle for getting the NFL on all three networks every single week during football season. That exposure greatly helped lead the NFL to the vast seas of revenue it enjoys today. Gifford broke into the NFL in 1952. Before then there were famous football players. Sammy Baugh, Bronko Nagurski, and Red Grange come to mind. During those fabulous 50s and into the 60s, football and television married. Not only did people like Gifford and Johnny Unitas become famous football players, they became American icons, woven into the fabric of our culture.